Traditional smoke detecting technology, such as beam detection or spot smoke detectors, has a history of being problematic in large open areas. These massive spaces have issues such as smoke stratification caused by high ceilings and/or dilution of the smoke due to high airflow making it difficult for conventional detection devices to operate. Not to mention the significant effort that is necessary just to test and inspect these devices per code requirements. More importantly, traditional technologies in these large areas take too long to detect smoke. 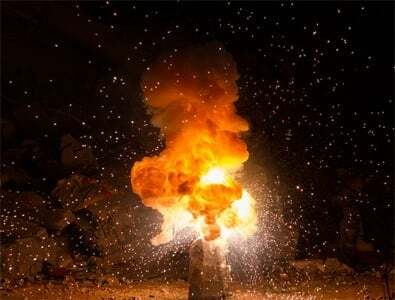 This makes it difficult to protect assets from the threat of fire in areas like power plants, warehouses, arenas, tunnels or in more unusual settings such as outdoor storage areas, lumberyards or trucking depots. 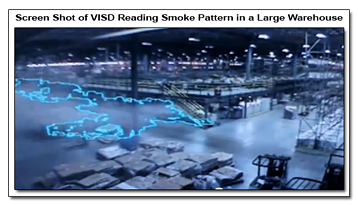 Video Image Smoke Detection (VISD) can solve many of the problems associated with these massive spaces. VISD will detect the smoke at the source of the fire and doesn’t wait for smoke or heat to reach the detectors mounted all the way at the ceiling or other remote location. Video Image Smoke Detection is an innovative detection technology that leverages digital video cameras and cutting edge video processing software. It is powerful, fast-acting, and can discriminate between flames and smoke. Best of all, VISD provides a video image that can be observed in real-time, helping responders quickly identify the location of the fire and make critical decisions such as when or where to evacuate. Just like other security devices, VISD systems allow for a digital recording of the event to be used by fire investigators and as a teaching tool on how to prevent fires in the future. How VISD works: The technology originated in the security industry from other forms of video analysis. VISD systems are designed to detect flames and/or smoke, the most visible characteristics of a fire. The digital image captured by each camera is sent to a computer processor which analyzes the image. If the processor reads smoke or flames, it sends a signal to the fire alarm system, just like any other fire detector. Through years of testing and field installations, VISD’s software has become extremely reliable, limiting the number of false alarms and only detecting real fire events. When Does VISD make sense? VISD for Flame Detection:One of the most unique features of VISD is the fact that it detects both smoke and flames. VISD cameras look at a fixed image for changes over time. Each pixel in the imageis analyzed for changes in brightness. When a pixel, or group of pixels, becomes brighter, the image processor software begins counting the flicker rate. When the software sees a flicker rate that it knows to be a flame, it sends an alarm signal to the fire alarm panel. VISD for Smoke Detection: Smoke detection for VISD is much like flame detection whereby each pixel in the image is analyzed for changes. The digital image becomes less defined as smoke moves through the field of view of the camera. The image processor tracks the obscured pixels and watches their movement. If the obscured pixels move and have lift, like smoke moves, then the processor confirms the movement as smoke and sends an alarm signal to the fire alarm panel. Active vs. Passive Detection: VISD does not wait for the smoke or flame to come to it; it is actively looking for any smoke or flame event. In comparison to passive detection technologies such as spot smoke detection or beam smoke detection, VISD responds faster. Third-party testing has shown that VISD has similar response times to other active smoke and fire detection technologies. One test conducted showed that VISD response time for a small smoke event was nearly as fast as air sampling smoke detection. Another test resulted in VISD detecting a flaming fire with equal speed to a UV/IR flame detector. VISD is worth consideration for protecting any large open area. If you have an application where VISD is worth considering or have further questions, ORR’s experts can help. Click Here to Ask the Expert.